The standard 12-lead ECG is still the most frequently recorded noninvasive test in medicine due to its accessibility and simplicity. The aim of the study is to analyze the relation between QT interval and T-wave variables in hypertensive patients, with and without left ventricular hypertrophy (LVH). Fifty-nine consecutive patients with grade 2 essential hypertension were enrolled in the study. The patients underwent standard 12-lead ECG and 2D-echocardiography. The most important inclusion criteria were: grade 2 hypertension, diagnosed considering the criteria of the European Society of Cardiology  and a written informed consent of the patient. The most important exclusion criteria were: atrial flutter or fibrillation, electrolyte imbalances, active infections, peripheral edema, and chronic obstructive pulmonary disease. The investigations conformed to the principles outlined in the Declaration of Helsinki (Cardiovascular Research 1997; 35:2-4) and were approved by the Ethics Committee of the University. The patients underwent standard 12-lead ECG at a paper speed of 25 mm/second, using a Cardioline Delta 3 Plus ECG unit. All subjects were in sinus rhythm. QTmax (the maximal duration of the QT interval in the 12 ECG leads), QTc (heart rate corrected QTmax), QTm (mean QT interval), QTd (QT dispersion), QTII (the QT interval in lead DII), QTcII (heart rate corrected QTII), and T-wave parameters: T0e (T wave duration), T0em (mean T0e), Tpe, Tpem (mean Tpe), Ta (T wave amplitude), and Tam (mean Ta) were manually measured in all 12 ECG leads. The QT interval duration was measured from the beginning of the Q wave (or R wave) to the end of the T wave. The T-wave end-points were determined by drawing the baseline and a line tangent to the T wave. Leads where the end of the T wave could not be determined or where the T wave had a low amplitude or was isoelectric or biphasic were eliminated. If a U wave was present, the QT interval was measured to the nadir of the curve between the T and U wave. Two consecutive QT intervals were measured in each lead, and the arithmetic mean was calculated. A minimum of eight leads was measured for each patient. Twelve-lead ECGs were examined by two independent observers, who were blinded to the clinical data and in case of a difference of >20 ms in each measurement, an agreement was obtained. Tpe represented the maximal Tpeak-Tend duration in all the ECG leads where the QT interval was measurable, and Tpem, the mean of Tpe from all the ECG leads where the QT interval was measurable. Ta was the maximal T-wave amplitude considering all ECG leads in which it was measurable and Tam the mean value of the T-wave amplitude in all ECG leads. Left ventricular hypertrophy was diagnosed using both echocardiography  (septal thickness and posterior wall thickness >1 cm in women and >1,1 cm in men) and the ECG,, criteria. Continuous variables are presented as means ± SD (standard deviation). Multiple regression analysis, Bravais-Pearson correlation coefficient (r), sensitivity, specificity, and Student's t-test were used as statistical methods. Differences between groups were evaluated using the Student's t-test. A P < 0.05 was considered statistically significant. 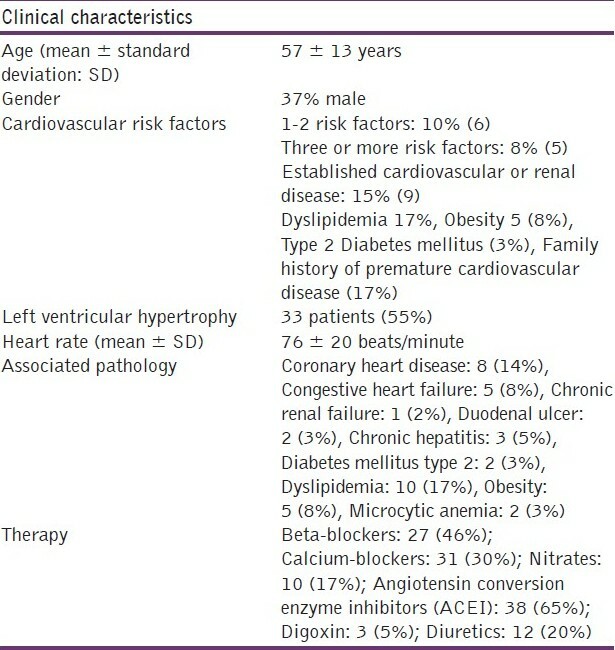 The clinical characteristics of the study population are included in [Table 1]. The following cardiovascular risk factors were identified: dyslipidemia, obesity (Body Mass Index >30 kg/m2 ), type 2 diabetes mellitus, and a family history of premature cardiovascular disease. Dyslipidemia was diagnosed considering the guidelines of the European Society of Cardiology: total cholesterol (>190 mg/dl), LDL-cholesterol (>115 mg/dl), HDL-cholesterol <40 mg/dl in men and <46 mg/dl in women), and triglycerides (>150 mg/dl). 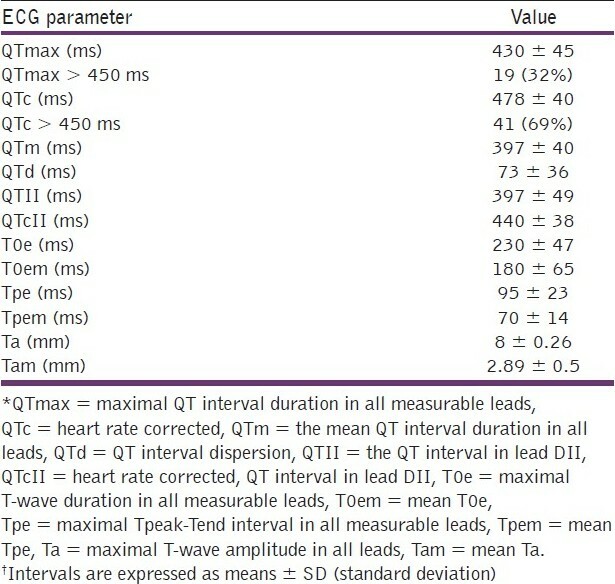 The ECG parameters values are included in [Table 2]. QTc was prolonged in 41 patients (69%). Multiple regression analysis revealed a significant association between QT intervals and T-wave parameters. QTmax was significantly associated with Tpe (P = 0.015), QTd with Tpe (P = 0.022) and Ta (P = 0.004), and Tpe with QTd and T0e (P < 0.05) [Table 3]. A P value of <0.05 was considered statistically significant. The most important association with regard to R square was, Tpe with QTd and T0e. 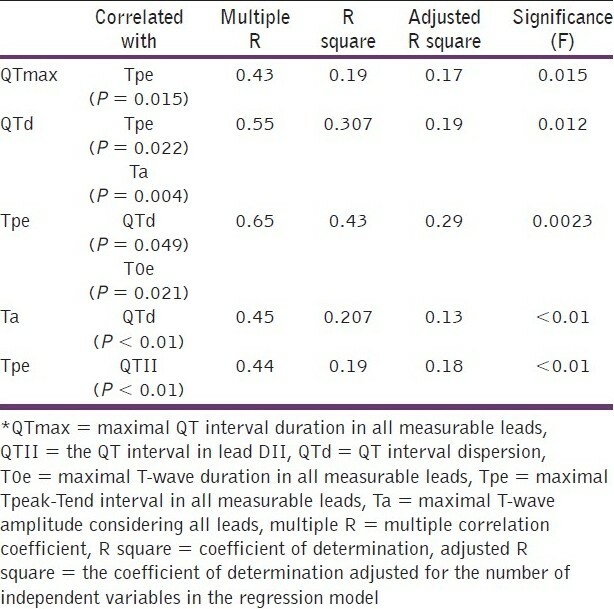 A moderate, but significant correlation was found between QT intervals and T-wave parameters: Tpe and QTmax (r = 0.43, P < 0.01), Tpe and QTII (r = 0.44, P < 0.01), and between Ta and QTd (r = 0.45, P < 0.01), where r was the Bravais-Pearson correlation coefficient. A prolonged QTc was more prevalent in hypertensive patients with LVH (85%), compared to hypertensive patients without LVH (50%). QTm, QTd, QTII, Tpe, and Tpem were significantly elevated (P < 0.05) in patients with LVH [Table 4]. The most sensitive ECG T-wave parameter was T0e ≥ 220 ms for both prolonged QTmax and QTc [Table 5] and [Table 6]. 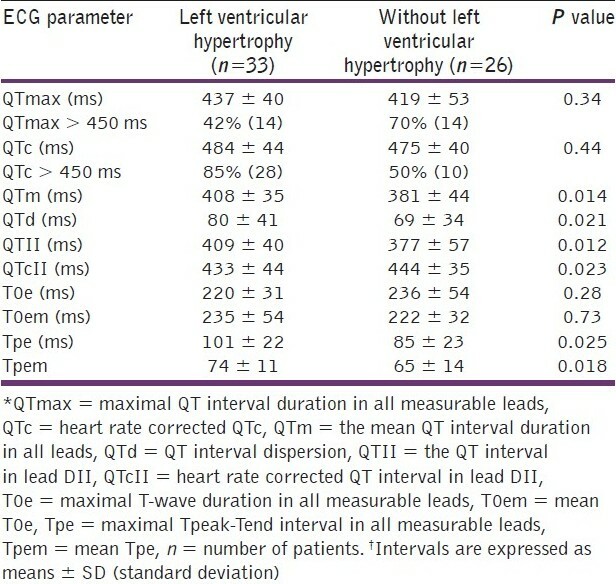 The most specific T-wave parameter was Tam ≥ 3 mm for prolonged QTmax and T0em ≥ 220 ms for prolonged QTc [Table 5] and [Table 6]. The main findings of our study are the high prevalence of prolonged QT intervals, the close connection between QT interval and T-wave variables, and QT and Tpe prolongation with left ventricular hypertrophy, in hypertensive patients. The close connection between the QT interval and T-wave variables was not demonstrated before in hypertensive patients, and no other study, as far as we know, predicted a prolonged QT interval using T-wave parameters. This could mean a similar prognostic value for ventricular arrhythmia and sudden cardiac death, but it should be the aim of another study. The values obtained for QT intervals and Tpe in the present study are similar to those of other studies. , Zhao et al.,  obtained lower values for QTc and Tpe compared to the present study. The most obvious reason for the differences is purely methodological: Zhao et al., used only leads V4-V6 for their electrocardiographic analyses, whereas, the present study has used all measurable leads and chosen the longest intervals from those leads as the principal measures. The main limitations were: the sample size, difficulties in delineating the end of the T wave in some leads, no clear consensus about the normal values for T-wave variables and QTd, and several additional QT interval prolonging and shortening factors. Considering the low number of patients and very few patients with a known history of ventricular arrhythmia, the results need to be confirmed in larger groups and follow-up studies. Difficulties in delineating the end of the T-wave in some leads are mentioned in several articles. ,,,, This is the reason why, leads in which the end of the T wave could not be assessed, were eliminated. Several factors may have had a contribution to QT interva[l prolongation and shortening. QT interval elongation is caused by: diabetes mellitus,  advanced age, heart failure, obesity, , coronary heart disease,  renal impairment,  and dyslipidemia. The number of patients with comorbidities has been low in our study. QT interval shortening may be caused by digitalis,  angiotensin converting enzyme inhibition,  and beta-blockers. The prevalence of patients with a prolonged QTc has still been high (69%), despite therapy. Age and gender have obvious effects on the repolarization time. This is the reason why they have been matched in the two hypertensive groups: with and without LVH. Hypertension is associated with an increased prevalence of prolonged QT intervals. QT interval and T-wave variables are closely connected in hypertensive patients. A prolonged QT interval can be predicted using T-wave parameters. QTm, T0em, Tpem, and Tam, do not provide significant additional information compared to QTmax, T0e, Tpe, and Ta. Left ventricular hypertrophy is associated with a prolonged QT interval and Tpeak-Tend interval. 3. Gussack I, Antzelevitch C. Electrical Diseases of the Heart. Genetics, Mechanisms, Treatment, Prevention. Springer: London Limited. Verlag; 2008. 5. Malik M, Batchvarov V. Measurement, interpretation and clinical potential of QT dispersion. J Am Coll Cardiol 2000;36:1749-66. 6. Celi A. QT dispersion: Time for a revival? Intern Emerg Med 2006;1:262-3. 7. Mozos I, Hancu M, Jost N, Cristescu A. Multipolar QRST isointegral maps and QT dispersion in old myocardial infarction. Acta Physiol Hung 2010;97:11-21. 9. Gupta P, Patel C, Patel H, Narayanaswamy S, Malhotra B, Geen JT, et al. Tp-e/QT ratio as an index of arrhythmogenesis. J Electrocardiol 2008;41:567-74. 10. Mozos I, Costea C. The QT interval and left ventricular hypertrophy in essential hypertension. In: Sobieszczanska M, Jagielski J, Macfarlane PW, editors. Electrocardiology 2009. Proceedings of the 36 th International Congress on Electrocardiology, Wroclaw, Poland: JAKS Publishing Company; 2010. p. 203-9. 12. Mozos I, Costea C, Serban C, Susan L. Factors associated with a prolonged QT interval in liver cirrhosis patients. J Electrocardiol 2011;44:105-8. 13. Mozos I, Hancu M, Cristescu A. Ventricular arrhythmia risk in elderly heart failure patients. Rev Glob Med Healthcare Res 2010;1:18-29. 14. Kunavarapu C, Bloomfield D. Role of noninvasive studies in risk stratification for sudden cardiac death. Clin Cardiol 2004;27:192-7. 15. Baguet JP, Erdine S, Mallion JM. Hypertension and arrhythmia. European Society of Hypertension Scientific Newsletter: Update Hypertens Manag 2005;6:24. 16. Mancia G, De Baker G, Dominiczak A, Cifkova R, Fagard R, Germano G, et al. Guidelines for the management of arterial hypertension. Eur Heart J 2007;28:1462-536. 17. Turrini P, Corrado D, Basso C, Nava A, Bauce B, Thiene G. Dispersion of Ventricular Depolarisation-Repolarisation. Circulation 2001;103:3075-80. 18. Bazett HC. An analysis of the time-relations of the electrocardiogram. Heart 1920;7:353-70. 19. Jain H, Avasthi R. Correlation between dipsersion of repolarization (QT dispersion) and ventricular ectopic beat frequency in patients with acute myocardial infarction: A marker for risk of arrhythmogenesis? Int J Cardiol 2004;93:69-73. 20. Ibanez A, Ferrero Jr. The ECG T-wave duration as an index of dispersion of ventricular repolarization: Insights from simulations. Comput Cardiol 2006;33:793-6. 21. Hevia JC, Antzelevitch C, Tornés Bárzaga F, Sanchez MD, Balea FD, Molina RZ, et al. Tpeak-Tend and Tpeak-Tend Dispersion as Risk Factors for Ventricular Tachycardia/Ventricular Fibrillation in Patients With the Brugada Syndrome. J Am Coll Cardiol 2006;47:1828-34. 22. Lang RM, Bierig M, Devereux RB, Flachskampf FA, Foster E, Pellikka PA, et al. Recommendations for Chamber Quantification: A Report from the American Society of Echocardiography's Guidelines and Standards Committee and the Chamber Quantification Writing Group, Developed in Conjunction with the European Association of Echocardiography. J Am Soc Echocardiogr 2005;18:1440-63. 23. Romhilt DW, Estes EH Jr. A point-score system for the ECG diagnosis of left ventricular hypertrophy. Am Heart J 1968;75:752-8. 24. Sokolov M, Lyon TP. The ventricular complex in left ventricular hypertrophy as obtained by unipolar precordial and limb leads. Am Heart J 1949;37:161-86. 25. Casale PN, Devereux RB, Kligfield P, Eisenberg RR, Miller DH, Chaudhary BS, et al. Electrocardiographic detection of left ventricular hypertrophy: Development and prospective validation of improved criteria. J Am Coll Cardiol 1985;6:572-80. 26. Oikarinen L, Nieminen MS, Viitasalo M, Toivonen L, Jern S, Dahlof B, et al. QRS Duration and QT Interval Predict Mortality in Hypertensive Patients with Left Ventricular Hypertrophy. The Losartan Intervention for Endpoint Reduction in Hypertension Study. Hypertension 2004;43:1029-34. 27. Hancock EW, Deal BJ, Mirvis DM, Okin P, Kligfield P, Gettes LS. AHA/ACCF/HRS Recommendations for the Standardization and Interpretation of the Electrocardiogram: Part V: Electrocardiogram changes associated with cardiac chamber hypertrophy. Circulation 2009;19:e251-61. 28. Xu X, Rials SJ, Wu Y, Salata JJ, Liu T, Bharucha DB, et al. Left ventricular hypertrophy decreases slowly but not rapidly activating delayed rectifier potassium currents of epicardial and endocardial myocytes in rabbits. Circulation 2001;103:1585-90. 29. Kanters JK, Haarmark C, Vedel-Larsen E, Andersen MP, Graff C, Struijk JJ, et al. Tpeak Tend interval in long QT syndrome. J Electrocardiol 2008;41:603-8. 30. Wolk R, Mazurek T, Lusawa T, Wasek W, Rezler J. Left ventricular hypertrophy increases transepicardial dispersion of repolarisation in hypertensive patients: A differential effect on QTpeak and QTend dispersion. Eur J Clin Invest 2001;31:563-9. 31. Kumar R, Fisher M, Macfarlane PW. Diabetes and the QT interval: Time for debate. Br J Diabetes Vasc Dis 2004;4:146-50. 32. Crouch MA, Limon L, Cassano AT. Clinical relevance and management of drug-related QT interval prolongation. Pharmacotherapy 2003;23:881-908. 33. Schutte D, Obel WP. Dangerous and life-threatening drugs-practical lessons from the long QT syndrome. Cardiovasc J S Afr 2002;13:54-61. 34. Sohaib SM, Papacosta O, Morris R, Macfarlane PW, Whincup PH. Length of the QT interval: Determinants and prognostic implications in a population-based prospective study of older men. J Electrocardiol 2008;41:704-10. 35. Mozos I, Serban C, Costea C. The renal function and the QT interval in hypertensive patients. Rom Rev Lab Med 2010;2/4(18):36. 36. Mozos I, Costea C. Serum cholesterol, triglycerides and the QT interval in hypertensive patients. Atheroscler Suppl 2010;2:132. 37. Funada A, Hayashi K, Ino H, Fujino N, Uchiyama K, Sakata K, et al. Assessment of QT intervals and prevalence of short QT syndome in Japan. Clin Cardiol 2008;31:270-4. 38. Dias da Silva VJ, Ferreira Neto E, Salgado HC, Fazan R Jr. Chronic converting enzyme inhibition normalizes QT interval in aging rats. Braz J Med Biol Res 2002;35:1025-31. 39. Bennett MT, Gula LJ, Klein GJ, Skanes AC, Yee R, Chattha I, et al. Do beta-blockers affect non corrected QT interval in type 1 long QT syndrome? Circulation 2009;120:S653. Mozos, I. and Filimon, L.
Clemente, D. and Pereira, T. and Ribeiro, S.
Mozos, I. and Serban, C. and Mihaescu, R.